Happy Birthday to you, lovely Kitty. Your celebration with all your loved ones around you sounds wonderful. I love the idea of notes inside the balloons. The children would have loved popping them. Oh my, that trifle looks utterly delicious. 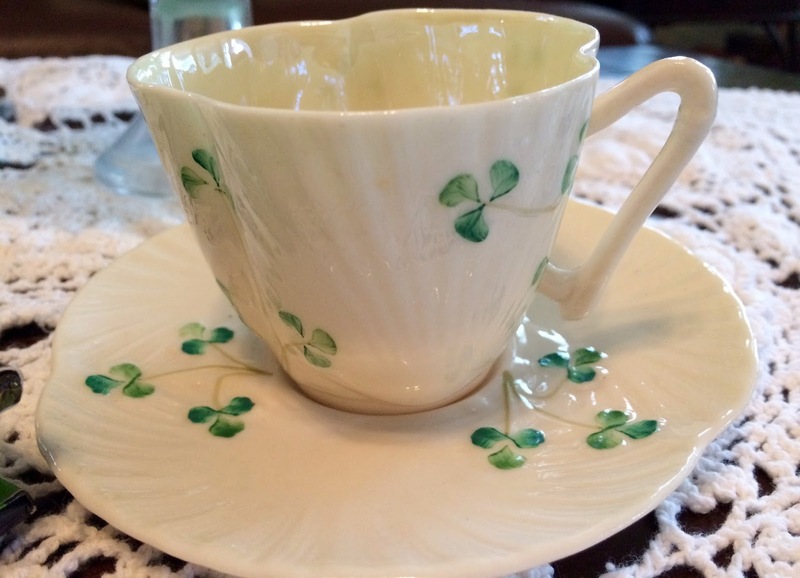 Love the pretty Belleek teacup, 'tis perfect for St Patrick's Day. What a wonderful birthday celebration Kitty! Love the balloons how sweet to find notes tucked inside! I know your heart was bursting! The salted caramel brownie trifle sounds much better than cake!! 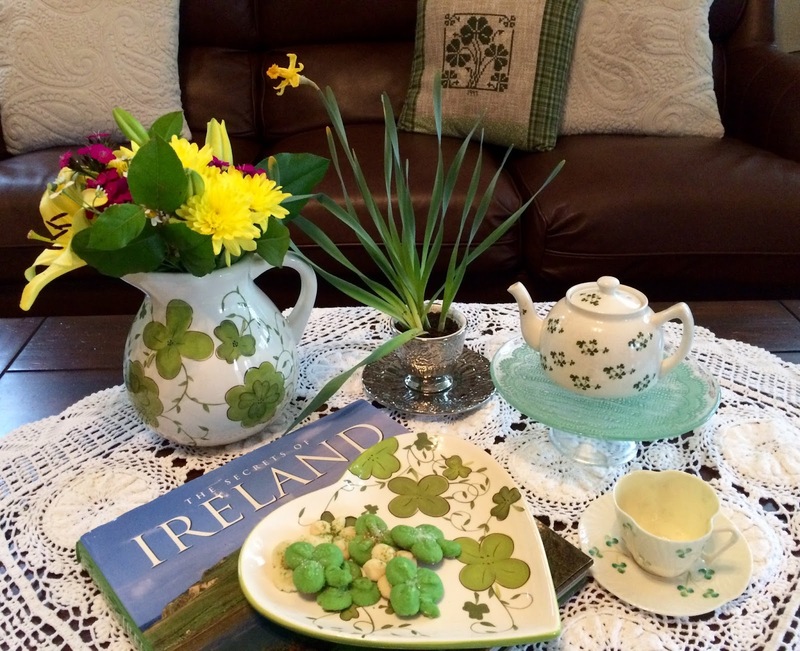 Your St. Pat's vignette with special china and cookies is beautiful! Have a great week! Hi Kitty, happy belated birthday to you!!! Oh nice to celebrate it with your family. The cookies are so cute and you must have had a fun time baking them with Cissy. 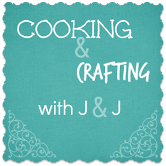 Thanks for sharing the recipe at our C&C with J&J. Happy Belated Birthday Kitty! My mom's birthday is February 27th and I have a friend whose is the 23rd and SIL, the 24th! I love the sweet idea of the notes inside the balloons and seeing all your adorable grands! Lynn's spritz cookies make a delicious St. Paddy's Day treat and I'm dreaming of your birthday salted caramel brownie trifle! Happy Belated Birthday!What a especial celebration!How darling your post is...Always inspiring!Love your pretty shamrock china.Hugs! I'm so glad that you had a fun birthday celebration. I'm intrigued by the yummy salted caramel brownie trifle and I may have to borrow the note-in-a-balloon idea for my godson (just gotta wait until he's old enough to read. HA!). 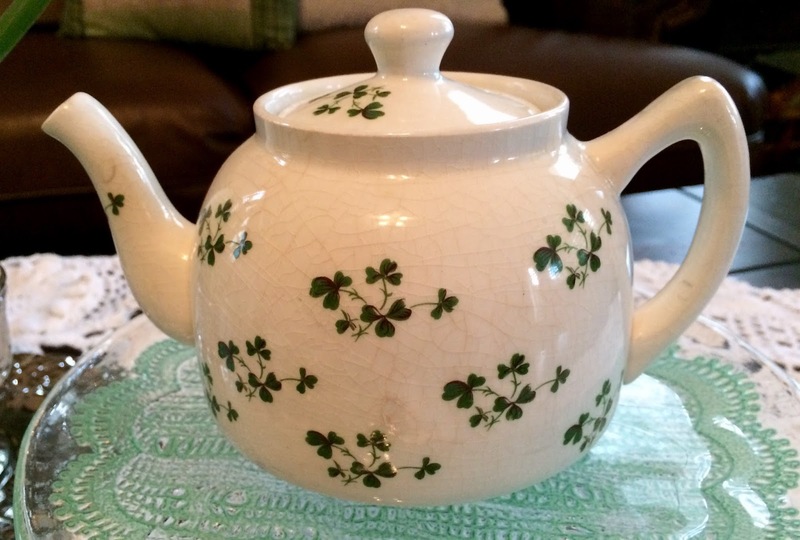 Your shamrock cookies, teapot (what a steal!) and Shelley teacup are all delightful. Kitty, you has such a sweet birthday. Love seeing the pics of your lovely family. The notes in the balloons is such a cute idea. I know you cherish the notes and Cissy is right, read them anytime for an uplifting memory. Love your teapot and the Belleek, so pretty. Yummy goodies too. A belated Happy Birthday Kitty......Hugs. Oh, sweet friend, this is all so wonderful!!! I am so thankful you had such a lovely time. You certainly deserve it! I just noticed that Avery looks SO much like you!! You have a lovely family, and God surely has blessed you. So very happy for you and praying for you every, single day. Dear Kitty, what a beautiful birthday celebration with your family. How they love you, and you love them. The Belleek teacup is so pretty. Belated Birthday greetings to you. That little Cissy....she truly was sent straight from heaven, wasn't she? She knows just what to say and do, and at all the right times. And look how adorable her outfit was at your party! Not to take away from any of the other wonderful grands you have - 7 in all?! What a joyful birthday, Kitty, and your always timely, always fetching themes for tea and sweets are so inviting. Thanks for letting us share with you. Happy Birthday, Kitty! Looks like a great celebration. Charming vignette with shamrock cookies. I have that disc with my spritz gun. Never thought about making shamrock cookies. I only use it at Christmas! Your birthday triffle was fantastic! Well, what a memorable birthday party that must have been! I love the part about the sweet notes in the balloons. Going to Ireland is on my bucket list and I love the sweet teapot and cup...oh and of course those shamrock cookies are so very festive! Have a wonderful week, Kitty! Happy Birthday to your son! The cookies look so good. What a good deal you found on the teapot. So nice to visit with you. Have a lovely week! Happy birthday! What a special party! And I love your Irish things! The teapot is wonderful, and I love Belleek! I am making spritz this week for sure! Wonderful post. So glad your family is so close for lots of time together! Have a lovely week and thanks for linking to Tuesday Cuppa Tea! Awwwww...what a sweet celebration! Hearts and bellies full!!! I’ve never heard of chocolate spritz cookies. Have I been living in a cave? I’ve always had or made the plain kind, which I love. Chocolate ones open up a whole new world!!! Happy birthday again dear Kitty. Those babies are so sweet. I know that you enjoyed each and every minute of your precious family. What a sweet tea pot. Love the shamrocks. Hugs and blessings dear lady. What a fabulous birthday party! Wishing you a happy birthday, birth week, and birth month! 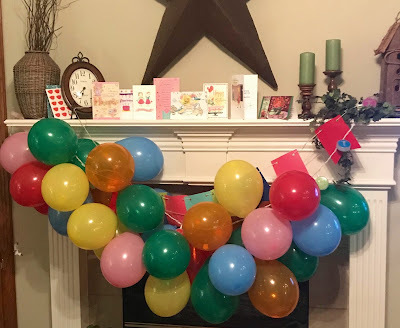 What a fun idea with the balloons! So sweet for you, and so fun for the kids. The cookies are so cute and I remember thinking Spritz cookies were just magical when I was little. I was born in Cork. Although, my parents brought me to the U.S. when I was 3 weeks old. Your birthday looks like it was a lot of fun. As usual, your recipe is very tempting! Sounds like the perfect celebration, Kitty! And thanks for reminding me about spritz cookies - it's probably been decades since I last made them. Must remedy that soon. What a devoted family and I know they love you dearly as you are such a wonderful Grandmama! I do love that Irish teapot and how special to find it as a bargain. That always works well! Thanks for sharing your delicious candy! What a great family celebration! 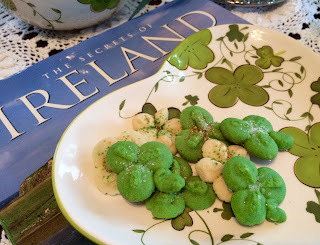 Your White Chocolate Spritz Shamrocks look delicious! Thanks so much for sharing your awesome post with us at Full Plate Thursday. Hope you have a great St. Patrick's Day and come back to see us real soon! The beer selection at this place was great and rotates often. Everyone who works at San Francisco venues makes you feel welcome. They remember your favorite drink and you will be glad to tweet about them. Cute, cute. I love the green. Thanks for sharing at Keep In Touch. Sweetest Kitty, this post brought tears to my eyes. 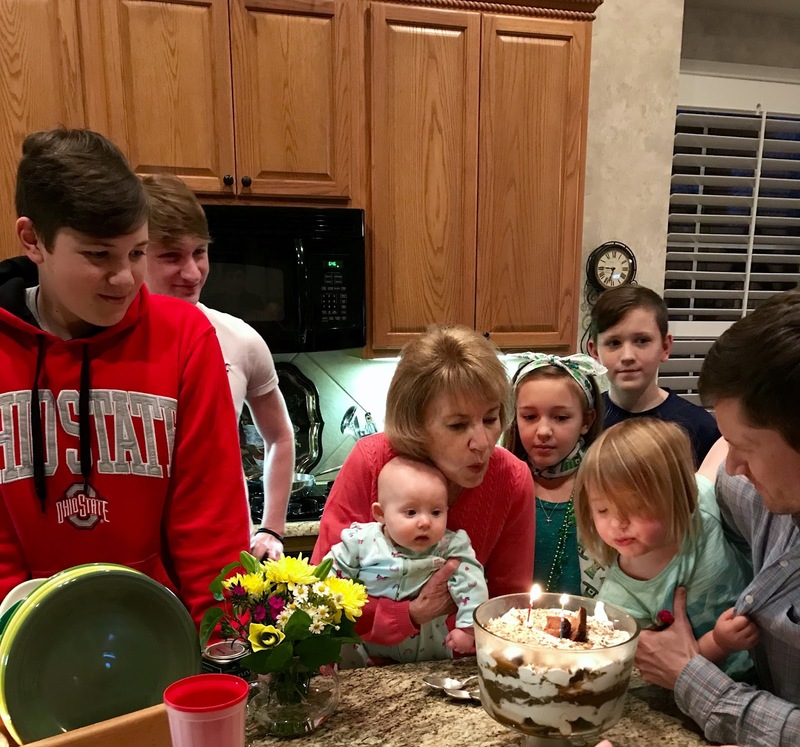 I know you had shared your precious birthday celebration with me in an email, but seeing these sweet pictures was truly a delight. You are such a dear, dear lady. Thinking of you and sending love your way! There is so much to love about this post, Kitty! First of all, Happy Belated Birthday to you!! It looks like you had a wonderful day. :) You're so blessed to have such a large, loving family. 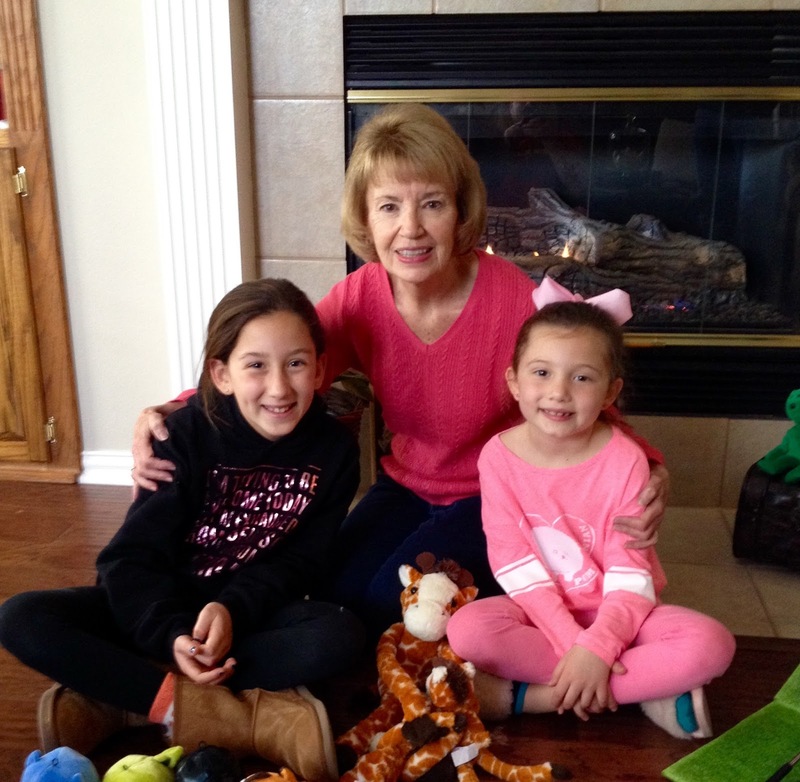 Your grands are so precious, and your daughter's balloon idea was so special! I hope you had a lovely birthday this year, Kitty, and many more to come. Happy Friday!